Discussion in 'Latest News' started by Pycella, Nov 29, 2018. The Yule is right around the corner! And that means that the Grand Order hobbits will put up a Yule calendar right here on their noticeboard. From 1st December until 24th December, we will present you yuleish, hobbity surprises to help you prepare for the holidays and get into a cheerful mood. There will be recipes, drawings, poems, music, games and maybe even some silly things. The surprises will be presented here, in this thread. Each day, a new surprise will wait for you. We hope that you'll enjoy the calendar! Mollywobbles, Lina and Rubellita like this. It's December, and time to reveal our first Yule calendar surprise! It's one of my favourite pie recipes with a Yuleish twist! In the northern part of the Shire, lingonberries are quite common at the table. Crushed lingonberries are a grand side dish for venison foods, among others. But we also use them in pies! Here is one of my favourite sweet pies that is also easy to make. It is my version of the key lime pie: here, the exotic lime has been replaced with Overhill lingonberries and the bottom crust is made of gingerbread biscuits to make it more Yuleish. I love how the lingonberries balance the sweetness of the pie here. Only the egg yolks are used in the recipe, so you can fry the egg whites for breakfast or make some sweet meringue from them. Preheat oven to 150 °C and grease a springform pan. For the bottom crust, mix the crushed gingerbread biscuits with the melted butter and the sugar in a bowl. Press it into the bottom and the sides of a 24 cm springform pan. Bake crust in the preheated oven for 10 minutes. When the crust has been prebaked, take it from the oven and preheat the oven to 175 °C. For the filling, press the juice out from the lingonberries in a cup. In a bowl, whisk the egg yolks and the condensed milk until the mix is light-coloured and foamy. Continue whisking the mix and pour in the crushed lingonberries (along with their juice) and add the vanilla sugar too. Pour the filling over the pie crust evenly. Bake the pie in the oven for 15 minutes until it’s set. When the pie has cooled down properly and you have removed it from the pan, you can top it with whipped cream (sweetened with vanilla sugar) and lingonberries. You can also sprinkle some gingerbread biscuit crumbs on top – whatever you like! You can also use more lingonberries in the filling, if you like. The pie is really sweet, so it’s good to balance the taste with lingonberries. The pie works with 4 egg yolks too, if someone has been visiting your chicken coop and you don’t have enough eggs. This recipe uses metric measures. You can convert them into other measures here. Ragwort, Mollywobbles, Rubellita and 5 others like this. Last year, people outside of the Grand Order couldn't add their comments here in this thread, but instead sent us letters saying they enjoyed the calendar. If you would like to leave feedback on the calendar this year, you can use this post over on my biscuity burrow: Celebrating Yule with us Laurelin hobbits. We'd love to hear from yer! Wildigard and Pycella like this. Our second Yule calendar surprise comes from outside the Order, from Piandao! He has sent us quite a few lovely Yule drawings to share in the calendar. Here is one of them. If you want to see more Middle-earth pictures from this fellow, see what the little birds tweet about him! Mollywobbles, Potty, Rubellita and 1 other person like this. Mollywobbles, Rubellita, Wildigard and 1 other person like this. Mollywobbles and Pycella like this. Our 4h Yule surprise comes from Miss Lina. She wants to share a local Yule tradition and some recipes that go along with it! 's a tasty read! One thing's for sure in Norway: Near yule, you need to eat "risgrøt" (rice porridge). Many eat it for lunch on Christmas Eve, but it goes down a treat both before and after too. The rice porridge is pretty simple to make. You basically cook medium-grain white rice in milk for about an hour, until the rice is tender and the porridge has thickened, see recipe below. Rice porridge ties in with yule for several reasons. First, it is the staple food of the "nisse", the Nordic yule version of garden gnomes, which might make an appearance later on in this calendar. Second, while Norwegians eat this porridge all year round, near yule they throw a blanched almond into to the cooking pot. Whoever finds the almond in their bowl during the meal gets an early yule treat, traditionally a huge lump of marzipan shaped as a pig. This inevitably turns the porridge eating into pantomime, with everyone looking mysteriously at each other and acting like they found the almond. More often than not, though, the almond manages to split into pieces equalling the number of children sitting around the table. The pieces find their way into the bowls of said children, which means they won't go away disappointed from the table and cry and fuss a lot. This is obviously a miraculous outcome due to the magic of yule, and it has nothing to do with the cunning knife-work and spooning of porridge of the grown-up who prepares the meal and who would like to enjoy Christmas Eve with some peace and quiet, no no. Third, rice porridge is the base ingredient of "riskrem" (rice cream/pudding, similar to the Danish risalamande), one of the more popular puddings for yule. Simple, fluffy, comforting, and oh so very very tasty. The recipes below are rather basic/traditional. It is possible to spruce them up a bit too! Heat the water to boiling, then add the rice and the salt. Allow the rice to simmer on low heat for ca 10 minutes until the water is near absorbed into the rice. Stir regularly. Then add the milk little by little, stir and reheat to boiling temperature. Then let the porridge simmer on low heat until suitably thick (ca 45 minutes). Stir frequently, so the milk and rice doesn't burn. Using a thick-bottomed cooking pot helps avoid this burning. For serving, scoop porridge into a bowl, sprinkle with sugar and ground cinnamon, and add a spoonful of butter in the middle of the bowl. Enjoy! And watch out for the almond! If you want a step-by-step description with lots of pictures, The Country Basket has a nice article on the making of the porridge. Whip the cream with the sugar until fluffy. Fold porridge into the cream until you get a nice fluffy consistency. Add vanilla sugar to taste. Serve with a berry sauce. The Danes love cherry sauce, while us Norwegians often go for strawberry or raspberry based sauces. Sprinkling the cream with almond slices is also very nice. For step-by-step instructions, have a look at The Country Basket again! Ragwort, Mollywobbles, Potty and 2 others like this. The 5th Yule calendar surprise is a Yule card from a bunch of hobbits who are about to bring some special Yule cheer to a very abominable snowbeast. Wait, is that a snowbeast...? Warm Hot Yule Greetings to everyhobbit! Ragwort, Mollywobbles, Potty and 3 others like this. Today, we reveal a Yule poem from Miss Nonette Shenanigan! If you have been to the Green Dragon on Fridays, you might have seen her uncle Matzo sitting at the back, grumbling about the loud music and all the racket. His nieces Nonette and Mira are merrier though! The picture is from Piandao. Yule comes upon us soon, and Miralith's gone to find a tree! Nowt better than that piney scent, to fill us all with Yule glee. I hope its tall and wide and grand but still fits through the door! And for the top, with elvish luck, we'll coax a star down from the skies. So while I wait for her return, I'll taste the spicy wine. For my uncle's in the kitchen grumbling loudly while he cooks. and cranberries, stuffing and chestnuts, and a big ol' roasted bird! so I'll grab a mug of ale and to the fire I'll retreat. Sherry, wine and brandy and a flagon full of scotch. Sho to Father Yule's health, I'll put the lot of 'em to the test! An' I hope to the hevvins thish spreddin' wet ish jus' the feskin' sch-snow. An' Mira'sh brawt beck a bleedin' tree! They drag ush bowf inshide. Ragwort, Mollywobbles, Potty and 4 others like this. For our 7th Yule calendar surprise, we have another Yule pie recipe! This one is called "Pycella's Fast Apple Pie". Simple, tasty and fast to make, this pie is perfect for the Yule table. For the crust, melt the butter and let it cool down in a bowl. Mix the baking powder into the wheat flour. Mix sugar, cream, egg and the wheat flour with the melted butter. Press into the bottom and edges of a greased pie pan. Place the apple slices on the pie crust and sprinkle the crushed almonds and/or pine nuts on top. Prebake the apple pie in the oven (200 °C) for 15 minutes. For the topping, mix the egg, cream, sugar, vanilla sugar and cinnamon in a bowl and pour the mix over the prebaked pie. Bake the pie for another 15 minutes or until it is baked properly. Serve the warm pie with vanilla sauce or ice cream. Ragwort, Mollywobbles, Wildigard and 4 others like this. For our 8th Yule calendar surprise, I made a drawing of our kin hall pig, Minna. She is Miss Tibba's breeding pig and likes to spend her time in our study, chewing Master Potty's precious scholarly scrolls. She also likes to munch the Yule decorations, when they are up. The mistletoe should be safely out of her reach though. But Master Potty should watch out when he strolls in the hall – he might be in trouble if he meets Minna under the mistletoe! You might see more vicious oinkers, if you come to the village of Oldfurlong today, where B.O.A.T. proudly presents the "Ode to Old Bloodtusk"! There might be some oinker-related violence against bounders. Oh, and some grand music to dance to! Welcome all! Ragwort, Mollywobbles, Wildigard and 3 others like this. Sunday morning coming down, and it's for a Yule tune by Miss Lina! It's an old tune she wrote some years ago, and it is based on a melody that is not from a traditional Yule tune. Here is also another drawing from Piandao. Ragwort, Mollywobbles, Wildigard and 2 others like this. Our 10th hobbity Yule surprise is a chilling tale! Storywise, it might be more fitting for the Fall festival than Yule, but 's a winter tale after all! A good way to say good bye to the Fall festival (encore). Once again, this picture is by Piandao! Here is a tale I told at the Green Dragon Friday on 19th January 2018, with a few amendments! This happened when I still was a small lass, during winter. I was travelling with my pa who wanted to visit his relatives in Staddle, near Bree-town. I liked travelling and visiting other places, but the relatives… They were the dullest ever! They could sip their teas for HOURS, sharing gossip and all that useless stuff with me pa. Then, they gave a virtually endless tour at their tater fields, showing them of… And the debates of imaginary fish catches and hunting trips… Blah! That’s no entertainment for a lass like me! I wanted to hear tales about dragons, go adventuring in the scary Bree-town, play all sorts of fun games… However, the adults were not up for somet like that at all! And then, as if by magic, I saw someone approach me. It was a young hobbit lad, fully dressed in winter clothes, smiling widely. “Nice work here!” he said, looking at my snowy creations. “Would you still have time and energy for a snowball battle?” The boy’s clothes were a bit messy and worn-out, but his face looked friendly. He gazed at me with his coal-black eyes eagerly. “Of course!” I said, and so I started a fierce snowball battle with the boy. It was fun, but after we hit my relatives’ burrow window a few times with snowballs and had to dodge some scolding from inside, we decided to go somewhere else to play. The boy said he lived there nearby, and he knew a place that was very good for snowball fights. We went to the edge of a forest where we found lots of virginal snow, just for us two! My woolly mittens were getting sogged, but the boy lent me his. He didn’t seem to mind the cold at all. It was getting dark and foggy, but it only made the snowball duel more challenging. We chased each other and moved a bit further from the forest. At one point, I had hit the boy with a rain of snowballs, and he was gathering himself for a revenge. “Catch me if you can!” I shouted and was about to run away into the fog that was suddenly getting thicker, when I sensed something strange… I looked back at the boy. He had stopped dead in his tracks. Only now I realized that his face was paler than any face I’d ever seen. No breath was coming out from his mouth, even though it was very cold… “I can’t go any further,” the boy said calmly. “You shouldn’t too.” “Why, what is it?” I asked, but then, the fog got thicker and I couldn’t see anything. After a moment, the fog disappeared, as fast as it had appeared… and the boy was gone. I looked around. As the fog went away, I could see more clearly… and I startled! I realized that I was standing on the edge of a frozen pond. Had I gone any further, the thin surface could have given away. “Oh that’s sweet, dear,” the old lady said. And I went there… but there was only a single snowhobbit there… But it had the very same clothes that the boy had had, just a while ago! And eyes, black as coal, a pale face... I shook my head, put the mittens in the snowhobbit’s hands and went back to the old lady. “That is... a wonderful snowhobbit down there. But where is the boy?” I asked. “No, that wasn’t my son, dear, you are mistaken,” the old lady said. “My boy fought his last snowball battle on the frozen pond many years ago,” the old lady sighed. I have never shivered so much. Had I been playing with a ghost? “But at least I can have him as a snowhobbit here with me,” the old lady said and smiled. I have never run faster to my relatives’ burrow. Suddenly, all that dull gossip beside a safe dinner table seemed very appealing to me! I never met that boy again… And sometimes, some snowhobbits give me goose bumps. For our 11th Yule calendar surprise, we have a selection of Yule drawings by Piandao from Winterhome! Still one week to go before this lovely Yuleish place opens up its gates to all. A lass peeking out from the bushes... Maybe she's getting ready to set off some fireworks? I know, this is not THAT kind of a calendar, but look at that... um, beard! Ragwort, Mollywobbles, Pennyroyal and 4 others like this. In our 12th Yule calendar entry, Miss Lina tells us something about the Yule-related Nordic nisse! Hmmm, could them be related to Master Potty's garden dwarf? If you read the calendar entry about "risgrøt" (rice porridge), you may remember that there is one character who really loves porridge: nissen*. For some reason, the nisse has become closely associated with yule in the Nordic countries. It wasn't always so. Originally, the nisse was a mythical creature in Nordic folklore. He was a tiny figure, less than a meter tall, sporting a long bushy white beard beneath a red conical cap. Traditionally, the nisse was a "guardian angel" of sorts at Nordic farmsteads, where he more often than not lived at the barn. The nisse had quite the temperament, and if the farmers didn't treat him well, he would dish out his revenge in the form of small pranks, like tying the cow's tails together or breaking things. If he got real angry, his punishments could be severe, like selling off your grain or even killing your livestock. If you were good to him, though, he would help with the harvest and take care of the farm animals. Hence, farmers often gave gifts to the nisse. And in the wintertime, near yule, he liked nothing better than a huge bowl of warm porridge, with a dollop of butter in the middle. Given his central position in the Nordic yule, the nisse figures heavily in yule decorations around here. Many houses put a lot of nisse figures and dolls on display when yule nears. Most children learned early on to make a nisse out of the cardboard core of toiled paper rolls. A lot of the yule food sold in the stores sport a nisse figure. He is pretty much everywhere. So, if yer see a red hat tip in the bushes as yule nears, spare a thought for the Nordic nisse. Oh, and be sure to put out a bowl of porridge. With a huge dollop of butter in the middle. Yer don't want to get on his bad side, surely? * Nisse is used in Norway and Denmark. In Sweden he is called tomte, while in Finland he's known as tonttu. Remember to send in photos of yule trees, if there are any near yer! Ideally before Monday 17th! Our 13rd Yule calendar entry reveals another Yuleish recipe: A Yule log cake from Frogmorton! And don't worry, it doesn't include any toad ingredients! Here is a traditional Yule cake from Frogmorton! I amended it a bit though – no frog legs in this one. Basically, it is just a sweet roll that has been formed in a way that it looks like a log. There are many ways to make this one. I tried this recipe a week ago and it worked – the log was eaten in 24 hours! I suppose you can use many things here as the filling (your favourite jam, buttercream, whipped cream, chocolate mousse…). In my area, we have flavoured quarks that make the filling a bit lighter than for example the buttercream. Preheat oven to 225 °C. In a bowl, whisk the eggs and sugar into a hard, light-coloured foam. Mix the dry ingredients together and add them into the egg–sugar foam carefully. Pour the dough evenly onto a baking pan covered with baking paper, smoothen it if necessary. Bake the dough in the preheated oven for approx. 7 minutes. Take another baking paper sheet and sprinkle it with sugar. Place the baked dough on the paper and let it cool down. Spread the raspberry jam on the dough. For the filling, whip the cream and add the quark and vanilla sugar. Spread the filling on the dough. Leave an area of 5 cm free at the front edge. Roll the dough. Place the roll with the seam side facing down. Cut the both ends “clean”, and then cut a piece off from both ends. Place the long remaining piece onto a serving tray. Form the two cut pieces into “branch stumps” and attach them onto the log or on its sides. Make the frosting: Melt the chocolate and mix it with the quark. Whip the cream and add it to the chocolate mix. Spread the frosting over the cake. Take a fork and run it down the length of the cake to make the surface look like bark. You can sprinkle some cocoa powder (through a sieve) on the cake to make the surface darker. For our 14th Yule calendar surprise, I have prepared something special: A Shire Quickpost Yule Delivery Game! It is a simple board game with a simple objective: try to deliver a Yule gift from the Brandy hall to Michel Delving before the other Quickpost hobbits. Good luck! 1. Print the attached PDFs that include the rules and the sheets for the board itself. (I had to make separate files for each, because otherwise the file would have been too large to be uploaded to this forum post.) If the pictures are too dark, adjust the brightness settings of your printer and print them again. 2. The sheets A, B and C are to be set vertically to each other: sheet A is the topmost sheet and C on the bottom. You can cut off the marginals at the connecting edges so that there are no gaps in the Quickpost route. I have added arrows to show to which direction the route should continue. 3. If you wish, you can laminate the sheets to make them more durable and/or attach them together with tape. 4. Get a 6-sided dice and game pieces for all players, and you’re good to go! The structure of this boardgame is based on an old, free board game I got from my bank’s kids club ”Leo the Lion Goes on a Summer Picnic”. It was the cruellest game imaginable – just when you thought you were winning, you ended up going back a long way, just because ”you forgot your keys at the beach. Oops!” I replaced the content, but the rules and structure are basically the same as in my old game. 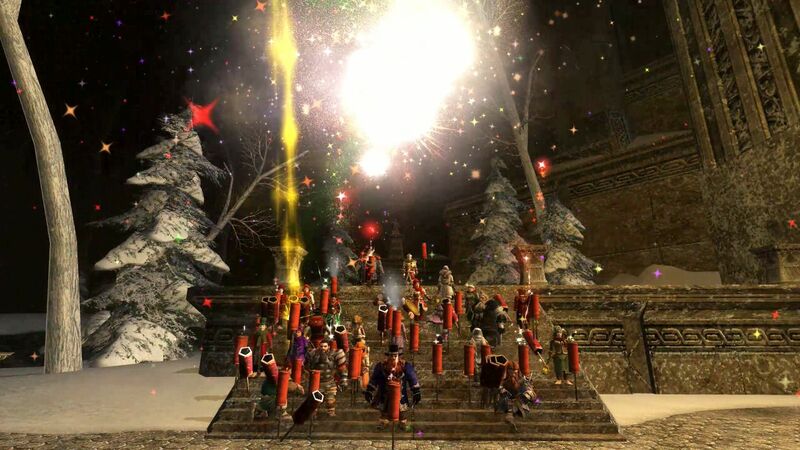 The pictures are more or less edited screenshots from LOTRO. Enjoy! If you spot any essential mistakes in the game, please let me know and I will correct them as soon as I can. Ragwort, Mollywobbles, Pennyroyal and 5 others like this. Wow, Pycella! You sure put a lot of effort in the Hobbity Yule Calendar! My thanks and congratulations! Our 15th Yule calendar surprise is a story from my former nanny, Miss Almi! She helps out in our small pieshop and is a talented cook with many wonderful recipes. Now, she has a story about Yule porridge, inspired by Miss Lina's earlier Yule porridge entry!This was told at the Green Dragon Friday yesterday. ”Which recipe do you mean?” I asked and attached a ribbon onto the stuffed bear’s head. ”The Yule porridge! Quite perfect for Yule breakfast, I think!” Pycella said, smiling. ”But…” Pycella started, but I interrupted her. ”You think that the almond makes the damn porridge any different?” I said, starting to lose my nerve. The porridge was slow to cook, so I decided to prepare it in advance on the evening before Yule day. I sat down by the stove and guarded the porridge pot. The scent filled up the whole kitchen… a scent full of memories! I smiled. How long had it been since I had smelled this scent the last time? I closed my eyes, and suddenly I was many, many years younger, a young lass, back at my childhood home. It was Yule morning and my ma had summoned all to the breakfast table. I saw myself sitting at the table, looking at my porridge bowl. My eyes filled with tears of hate. It wasn’t fair that I had to eat this, while the others had something special for breakfast! I went outside and wondered where I could scoop the porridge from my bowl. The nearby forest could be a good place to hide it. Maybe I could find some late berries for breakfast there. As I reached the forest border, I heard sniffing sounds from behind the bushes. I crept closer to see what it was and saw two rabbits facing each other next to a tree. It looked like they were talking to each other… and they were! “Aye. And they demand that we should go and visit their cousins in the north!” Daisy sniffed. “Well, I am sure you can come up with somet that will distract their thoughts from this topic, Daisy,” Lilly said and patted Daisy’s front paw. Then, the rabbits hopped into their holes, and I was left alone. I remembered my porridge bowl and looked at it. It was milky white and soft. I ran back inside. I could tell that I had just triggered my mother’s shenanigans alert, but she scooped more porridge into my bowl. “I thought you didn’t like this porridge, dear”, she said, raising her eyebrow. “Well, it is porridge is more magical at Yule, ma!” I said and ran out before she could ask more questions. I left the overfilled porridge bowl near Daisy’s rabbit hole, and went back inside. Next day, I came back to the forest edge to see if the porridge had disappeared (and get the bowl back). I saw the two rabbits, Daisy and Lilly, again, talking. “You should have seen those smiles!” Daisy chuckled. “Well, you said that Yule is the time for magic and miracles, didn’t you?” Daisy smiled. One thing was clear though: this porridge was magical. It had taken me back to my childhood, making me remember forgotten memories. When I sat at the table next morning and ate the porridge, my eyes watered again. But this time, not for hate. Oh, and I brought a bowl of it to the forest edge again. I bet the forest creatures need a Yule feast too. So remember this, young ones: There might be places, things and people that you try to avoid due to some unfortunate and bad incidents in the past. But behind those bad memories, there might be some golden ones hidden. Our memory is selective and betrays us. So give the past a chance. Merry Yule to you all! And remember to eat yer porridge! Mollywobbles, Rubellita, Potty and 1 other person like this.